Cathedral Window Pin Cushions and A Give-A-Way! Yippee! I have three finishes this week. Yes, they are small… but they are still finished! 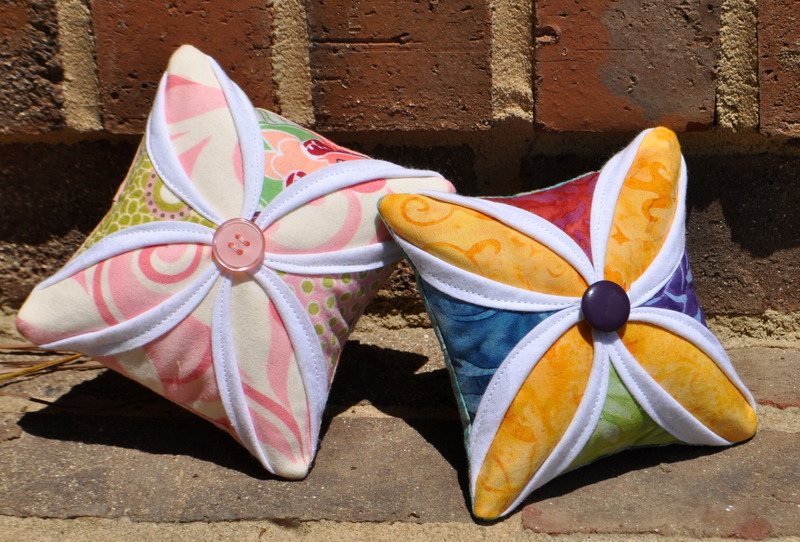 Next month we are doing a pin cushion swap at our quilt guild meeting. So I hopped online, did a quick search for pin cushion patterns, and found this one by My Go-Go Life. It was simple, it was cute, and it was modern. After the umbrella, I needed something a little easier and quicker. It fit the ticket! So, I made one, and then made another, and then another… I think I’m addicted. The monkeys even tested them out to make sure they worked. Well, that and it kept them busy for 30 minutes and helped them develop some fine motor skills, so I was good with it. 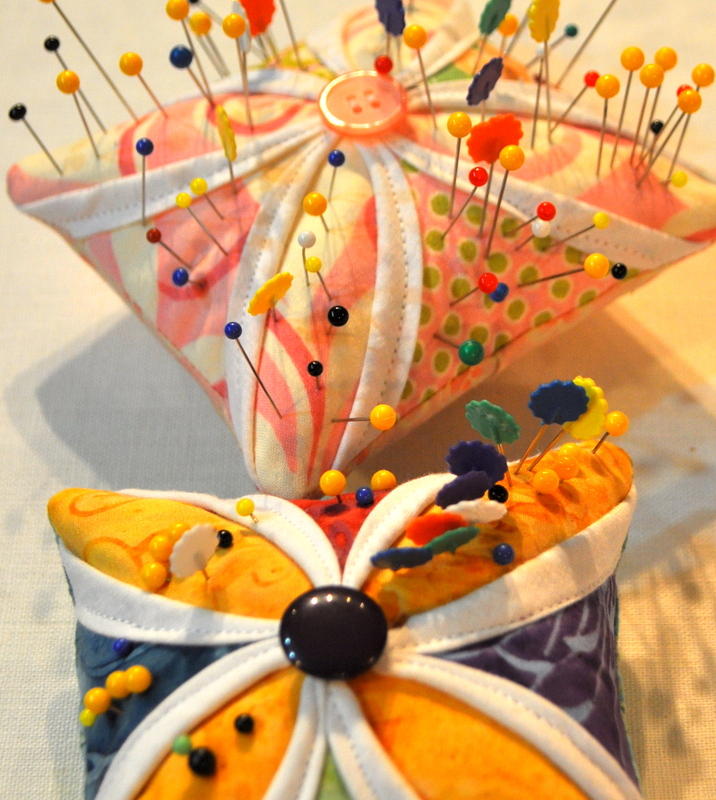 Who knew sticking pins in a pin cushion could be so fun? By the way, it’s not too late to vote for my umbrella. Just visit the Art Gallery Fabrics board on Pinterest, and pin and like to your hearts content. http://pinterest.com/artgalleryfab/make-it-right-apparel/ To see more information on this project, please see my writeup from last week. Oh, you’re still wondering about the give-a-way. Well, you see, I only need one pin cushion for the quilt guild meeting swap, but I made three; so that means I have two extra to give away to two lucky readers. And this is my first give-a-way ever, so I’m super excited! 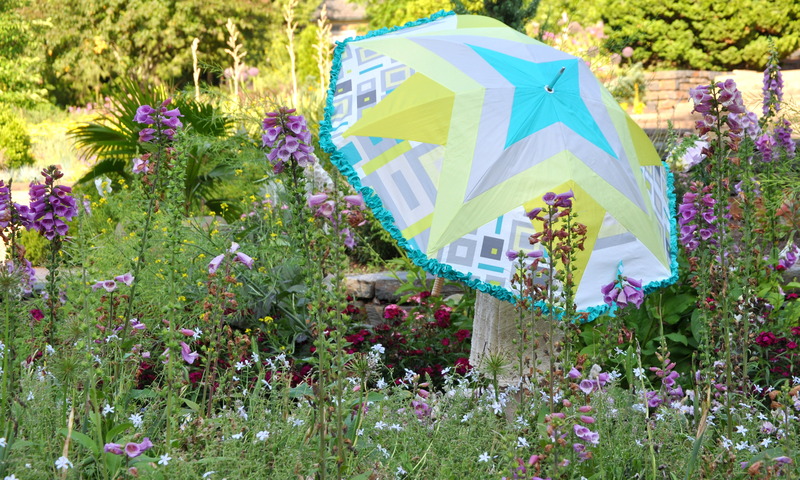 All you need to do is leave a comment about this week’s or last week’s finishes, or comment and let me know that you liked and/or repinned my umbrella on Art Gallery Fabric’s Pinterest board. Be sure to leave your email address if you are a no reply commenter. Then next Friday, June 21st, I’ll put it through the random number generator and draw two winning names. And the winners are Ashley & Leanne. Congratulations! This entry was posted in Quilting/Sewing and tagged agf, art, art gallery, cathedral, cushion, gallery, give-a-way, modern, pin, pin cushion, umbrella, vote, window by monkeyneedle. Bookmark the permalink. And I went and both liked and repinned your umbrella – looks like you’re doing well over there!! Your pincushions are adorable! And that umbrella – how amazing is that! Plus it makes such a cool picture for your header! Whoop whoop for you!!! Those are gorgeous! 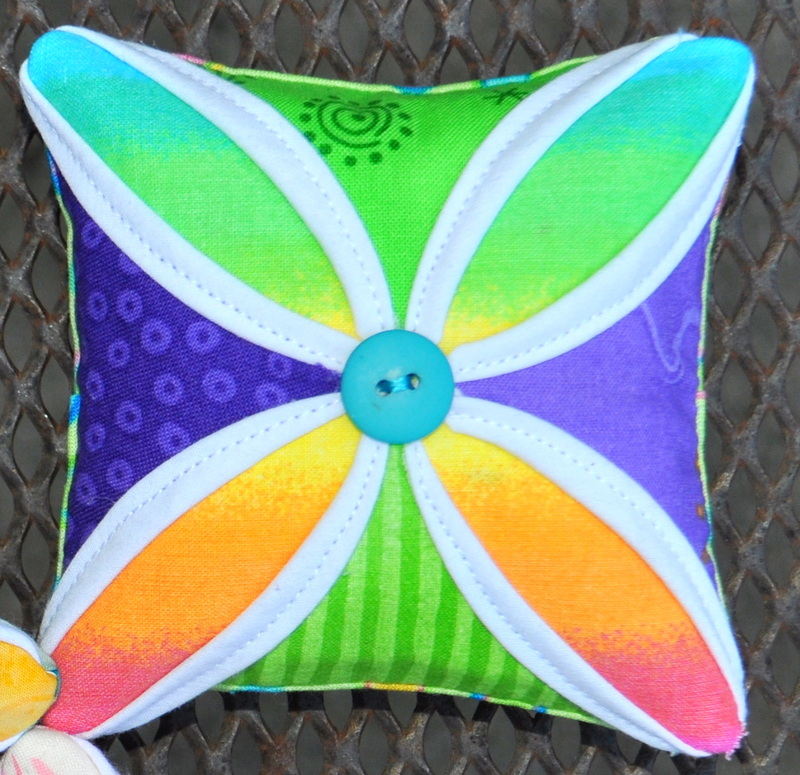 I don’t have a pincushion…sure would love to win one! 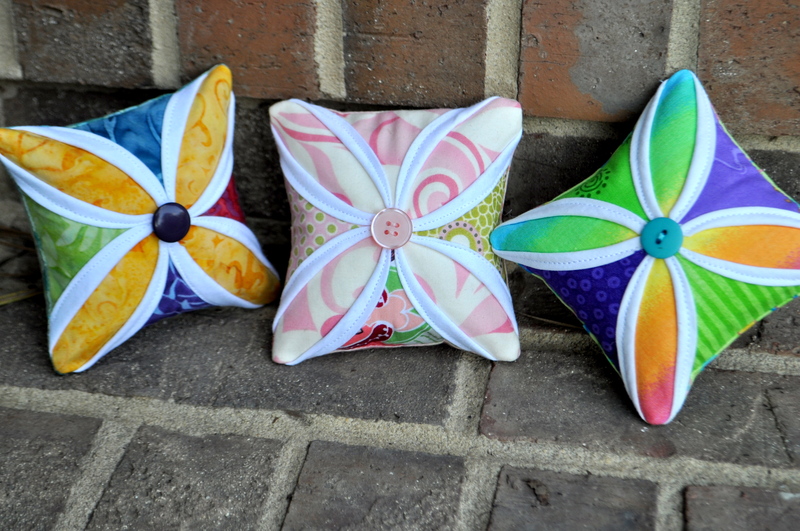 Oh, I love these pincushions and have wanted to make one since forever – yours are beautiful! I especially like your umbrella and Repinned and Liked it. Yours is definitely the ‘stand out’ entry and I certainly hope you win – you deserve it!